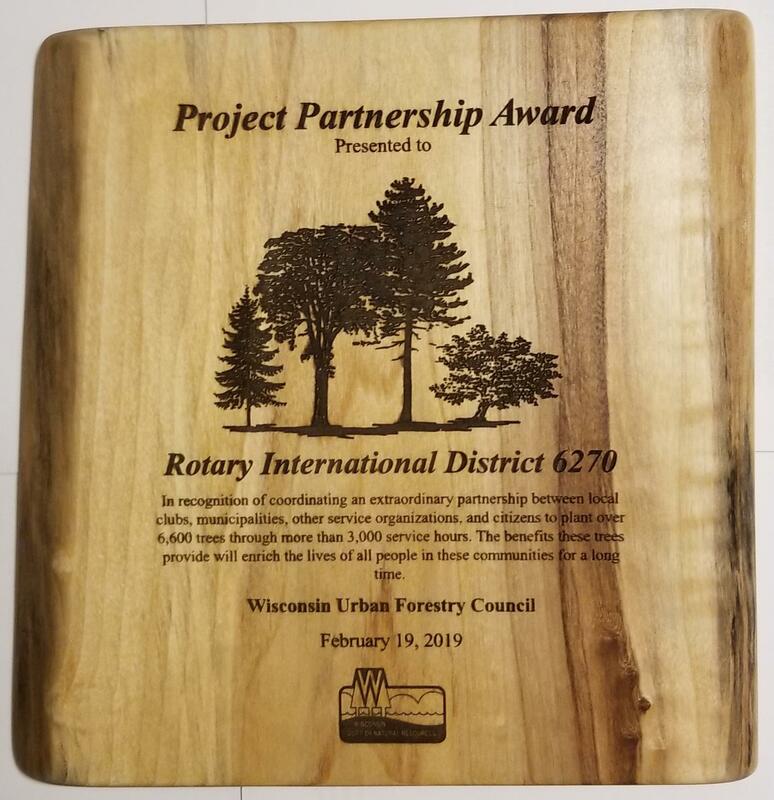 On Tuesday, Feb. 19, Rotary International District 6270 received the Project Partnership Award from the Wisconsin Urban Forestry Council. 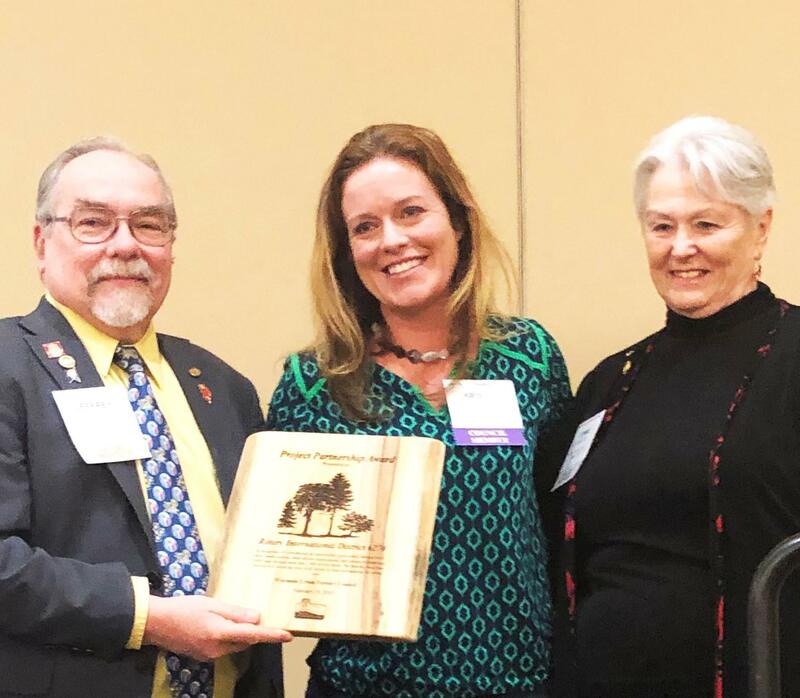 The award was presented at the 2019 Wisconsin Arborist Association/DNR Urban Forestry Conference at the KI Convention Center in Green Bay. Rotary District 6270 was recognized for extraordinary partnership between local Rotary Clubs, and municipalities, other service organizations, and citizens in planting trees. Receiving the award on behalf of Rotary District 6270 were Jeffrey Reed, 2017-18 Governor of Rotary District 6270 and member of Fond du Lac Morning Rotary Club; and Connie Pukaite, former Mayor of Mequon, leader in creating Mequon’s Rotary Park, and a past Director of the Wisconsin DNR, representing District Tree Planting Coordinator Brian Monroe and the Mequon-Thiensville Sunrise Rotary Club. Partners of the Rotary Clubs included city governments, schools, other service clubs (e.g., Lions), land trusts, boy/cub scouts, Rotaract and Interact clubs, environmental organizations, and others. Rotarians planted numerous varieties of trees, including apple, cedar, elm, fir, hackberry, hickory, oak, pine, river birch, spruce, and many other species. Some clubs secured grant funding to support tree planting. Clubs were assisted by Urban Foresters in the Wisconsin Department of Natural Resources and local governments. Rotarians also received support from the Environmental Sustainability Rotarian Action Group (ESRAG). The project was stimulated by a challenge issued world-wide to members of Rotary International by the 2017-18 Rotary President Ian Riseley. With over 1.2 million Rotary members, Riseley challenged each of the 35,000 Rotary Clubs in the world to Make a Difference by planting at least one tree for each of its Rotary Members during the Rotary Year. WASRAG has assembled a group of professionals to assist Rotary Clubs with their WASH projects. The team have experience in needs assessment, planning, grant preparation, implementation and WASH training. Members of the Professional Resources Team are from many countries, experienced in working in developing countries and are fluent in a number of languages. The WASRAG Board has established a WASRAG Fund to encourage Rotary clubs to undertake water and sanitation projects that are sustainable and well designed. Before a Club submits their Global Grant application to The Rotary Foundation they should send it to the WASRAG Fund review board at info@wasrag.org. WASRAG experts in water and sanitation programs will review the application and make suggestions to improve the quality of the project. 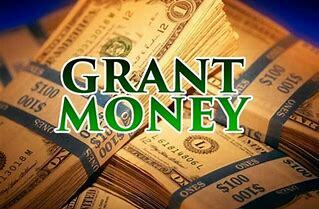 Once the suggestions are incorporated into the final application, WASRAG will contribute $500 towards the project. The world is fortunate to have Rotary Clubs like Box Hill Central, District 9810, in Australia that are so committed to giving every child the right to an education by providing clean water and sanitation to schools. The "We Can't Wait" NGO that was established by Mark Balla, with the support of the Box Hill Central Club, has agreed to support any WASH in Schools (WinS) project with $500 if it is approved by the WASRAG Fund review committee. That is $1,000 towards your water, sanitation and hygiene project in schools. Get planning. Send your Global Grant application to info@wasrag.org to apply for both WASRAG Fund and We Can't Wait grants. Kudos to Rotary for its Fight to End Polio! 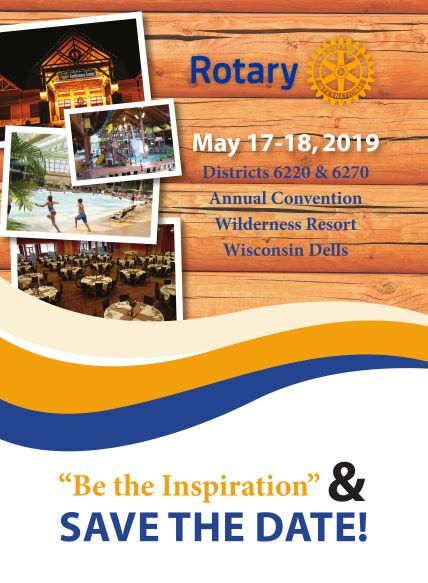 The new Discover Rotary PowerPoint presentation is now available (see "Site Pages" - "Rotary Resources"). 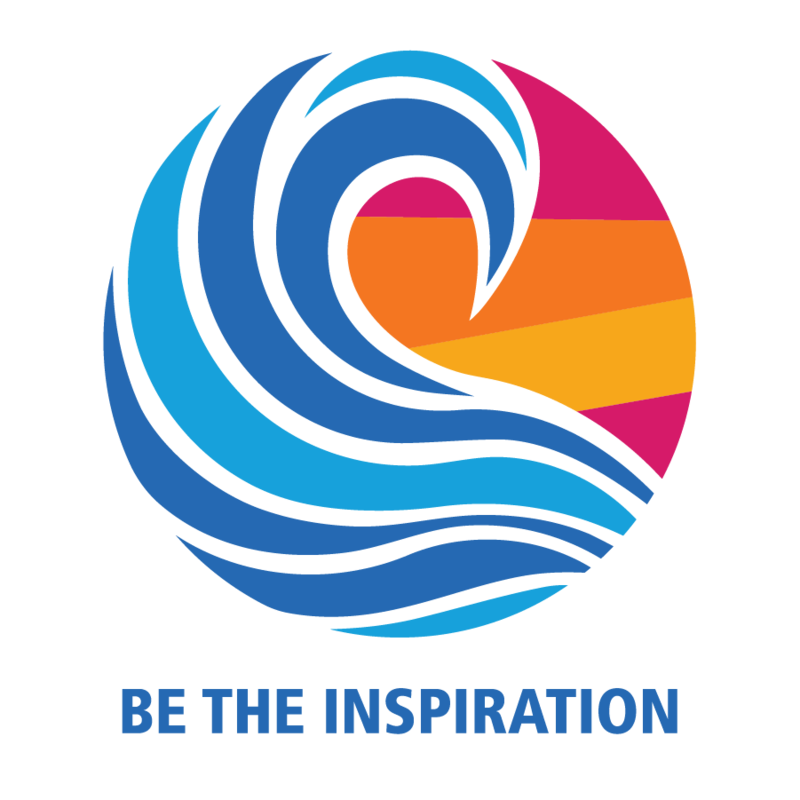 It provides an overview of Rotary, including our values, history, and the benefits of membership. Rotarians can add club-specific images and information to the presentation, which also comes with speaker notes. 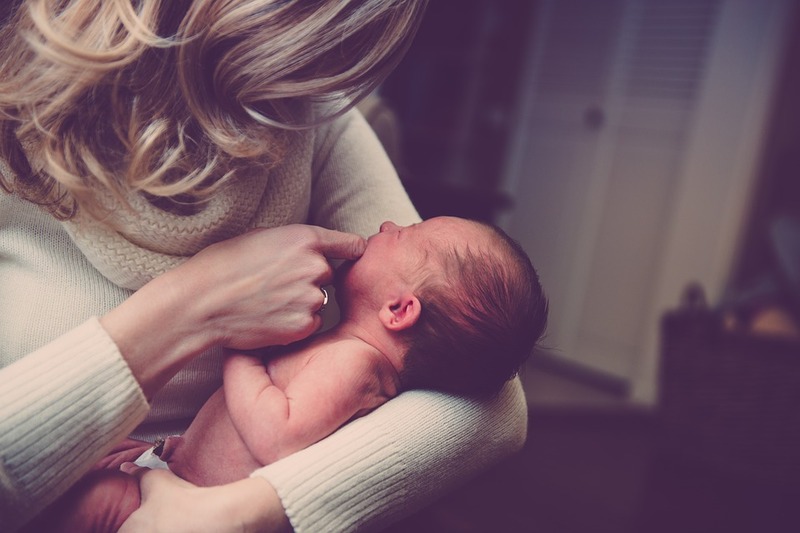 It can be helpful to anyone holding prospective member events, hosting prospective members at a meeting, or presenting to an audience of community members. Encourage Rotarians to have prospective member and club brochures on hand to distribute after the presentation. Be sure district membership chairs know about the presentation, so they can incorporate it into outreach activities.